For other uses, see Epidermis. The epidermis (from the Greek "επίδερμίδα", meaning "over-skin") is a single layer of cells that covers the leaves, flowers, roots and stems of plants. It forms a boundary between the plant and the external environment. The epidermis serves several functions: it protects against water loss, regulates gas exchange, secretes metabolic compounds, and (especially in roots) absorbs water and mineral nutrients. 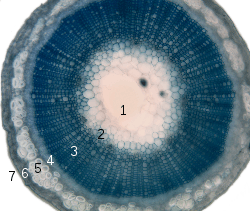 The epidermis of most leaves shows dorsoventral anatomy: the upper (adaxial) and lower (abaxial) surfaces have somewhat different construction and may serve different functions. Woody stems and some other stem structures produce a secondary covering called the periderm that replaces the epidermis as the protective covering. The cells of the epidermis are structurally and functionally variable. Most plants have an epidermis that is a single cell layer thick. 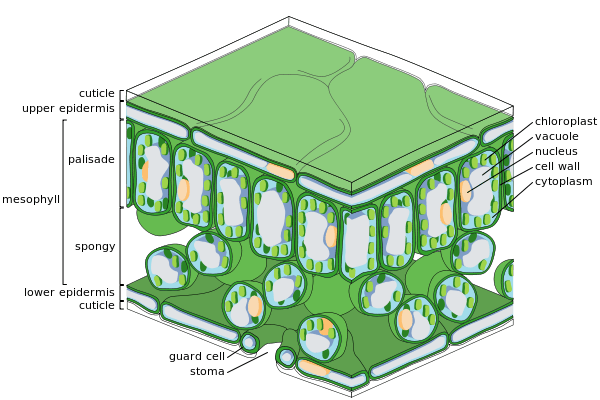 Some plants like Ficus elastica and Peperomia, which have periclinal cellular division within the protoderm of the leaves, have an epidermis with multiple cell layers. Epidermal cells are tightly linked to each other and provide mechanical strength and protection to the plant. The walls of the epidermal cells of the above ground parts of plants contain cutin, and are covered with a cuticle. The cuticle reduces water loss to the atmosphere, it is sometimes covered with wax in smooth sheets, granules, plates, tubes or filaments. The wax layers give some plants a whitish or bluish surface color. Surface wax acts as a moisture barrier and protects the plant from intense sunlight and wind. The underside of many leaves have a thinner cuticle than the top side, and leaves of plants from dry climates often have thickened cuticles to conserve water by reducing transpiration. The epidermal tissue includes several differentiated cell types: epidermal cells, guard cells, subsidiary cells, and epidermal hairs (trichomes). The epidermal cells are the most numerous, largest, and least specialized. These are typically more elongated in the leaves of monocots than in those of dicots. Trichomes or hairs grow out from the epidermis in many species. In root epidermis, epidermal hairs, termed root hairs are common and are specialized for absorption of water and mineral nutrients. In plants with secondary growth, the epidermis of roots and stems is usually replaced by a periderm through the action of a cork cambium. Guard Cells are the only epidermal cells that can make sugar. According to one theory, in sunlight the concentration of potassium ions (K+) increases in the guard cells. This, together with the sugars formed, lowers the water potential in the guard cells. As a result, water from other cells enter the guard cells by osmosis so they swell and become turgid. Because the guard cells have a thicker cellulose wall on one side of the cell, i.e. the side around the stomatal pore, the swollen guard cells become curved and pull the stomata open. 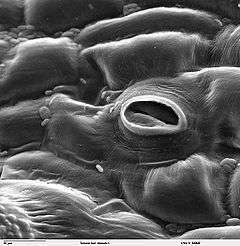 At night, the sugar is used up and water leaves the guard cells, so they become flaccid and the stomatal pore closes. In this way, they reduce the amount of water vapour escaping from the leaf. The plant epidermis consists of three main cell types: pavement cells, guard cells and their subsidiary cells that surround the stomata and trichomes, otherwise known as leaf hairs. The epidermis of petals also form a variation of trichomes called conical cells. 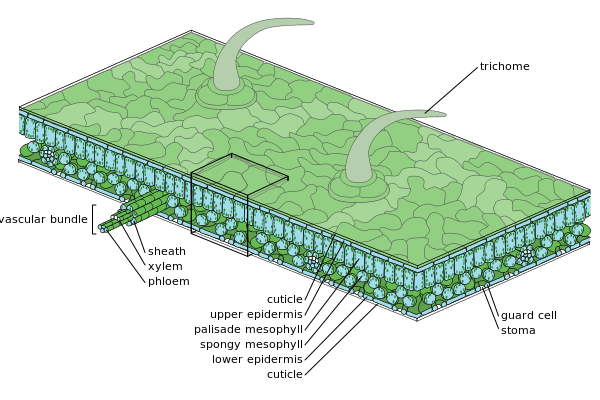 These cells all develop from the pavement cells, which make up the majority of the plants surface cells. In short, cellular differentiation of the epidermal cells is controlled by two major factors: genetics and environmental conditions. Trichomes develop at a distinct phase during the actual leaf development, under the control of two major trichome specification genes: TTG and GL1. The process may be controlled by the plant hormones gibberellins, and even if not completely controlled, gibberellins certainly have an effect on the development of the leaf hairs. GL1 causes endoreplication, the replication of DNA without subsequent cell division as well as cell expansion. GL1 turns on the expression of a second gene for trichome formation, GL2, which controls the final stages of trichome formation causing the cellular outgrowth. Arabidopsis thaliana uses the products of inhibitory genes to control the patterning of trichomes, such as TTG and TRY. The products of these genes will diffuse into the lateral cells, preventing them from forming trichomes and in the case of TRY promoting the formation of pavement cells. As previously mentioned, conical cells are a form of trichome that occurs on the petals of flowers. Expression of the gene MIXTA, or its analogue in other species, later in the process of cellular differentiation will cause the formation of conical cells over trichomes. MIXTA is a transcription factor. Stomatal patterning is a much more controlled process, as the stoma effect the plants water retention and respiration capabilities. As a consequence of these important functions, differentiation of cells to form stomata is also subject to environmental conditions to a much greater degree than other epidermal cell types. Stomata are holes in the plant epidermis that are surrounded by two guard cells, which control the opening and closing of the aperture. These guard cells are in turn surrounded by subsidiary cells which provide a supporting role for the guard cells. Stomata begin as stomatal meristemoids. The process varies between dicots and monocots. Spacing is thought to be essentially random in dicots though mutants do show it is under some form of genetic control, but it is more controlled in monocots, where stomata arise from specific asymmetric divisions of protodermal cells. The smaller of the two cells produced becomes the guard mother cells. Adjacent epidermal cells will also divide asymmetrically to form the subsidiary cells. Because stomata play such an important role in the plants survival, collecting information on their differentiation is difficult by the traditional means of genetic manipulation, as stomatal mutants tend to be unable to survive. Thus the control of the process is not well understood. Some genes have been identified. TMM is thought to control the timing of stomatal initiation specification and FLP is thought to be involved in preventing further division of the guard cells once they are formed. Environmental conditions affect the development of stomata, in particular their density on the leaf surface. It is thought that plant hormones, such as ethylene and cytokines, control the stomata’s developmental response to the environmental conditions. Accumulation of these hormones appears to cause increased stomatal density such as when the plants are kept in closed environments.